If you too are interested in earning money online, this article is for you. After reading this article, you’ll be able to earn money online. Also, there is no limit to how much money you can earn. It totally depends on you. As it is clear from the title, today I will be telling you how you can earn money online with the help of Paybitly shorten URL. With the help of URL shortening service, you can earn money online by shortening the long URLs of the websites. The good news is that no technical skills are required for URL shortening. Also, it is not mandatory to have a blog or a website. Paybitly provides URL shortening service to shorten the URLs. The Internet is a platform where you can share interesting links with your friends, followers over the social media or other platforms. However, sometimes the URLs becomes long and ugly. And sometimes the URLs contains referral links that people want to hide. Paybitly facilitates you to shorten the URLs and at the same time earn money online. Every time the user clicks on the shortened link, the user gets paid. When the visitor clicks on the shortened URL, it will wait for 5 seconds and then redirect you to the original URL. For these 5 seconds, the user will be shown ads. In this way, you get a profit share for every user click. 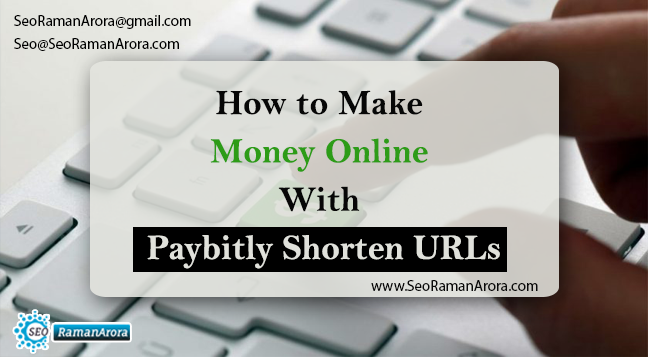 Below I am telling you a step by step procedure to get started with Paybitly Shorten URL. Go to Paybitly official website and click on the “Sign up” tab on the upper right corner. The sign-up form is simple as it can get. IT contains 4 fielArtificial intelligence companies are making solutions for the healthcareds only. Username, your email, password and confirm the password. Accept the term and conditions and click the submit button. After the registration, you will get an activation link on your email. Open the Email and all you have to do is to click on the “click here” link. You will be redirected to the Paybitly website and your account is activated and confirmed. After confirming the account, you can get started with shortening the long URL. Copy the shortened URL and start sharing the link. All your shortened URLs are available in the statistics tab. Sharing is not the only way to earn money with Paybitly. You can also earn by inviting the new user. For each invite, you will get 10% of their earnings. Go to the referral tab and share your referral link on Facebook, Twitter, Instagram, Google+ and more. You can also set up a full page script on your blog page or the website. The Paybitly full page script will transform all your links to Paybitly form. Just copy the code and paste it to the body section of the HTML code. You can also include or exclude tArtificial intelligence companies are making solutions for the healthcarehe domains that you want to shorten. After you have enough funds in your account, you can withdraw the money you have earned. But remember that in order to withdraw the money, you need to complete your profile first. Paybitly transfers the money instantly to the account. Minimum withdrawal for Tez is $3, $5 for Paytm, $10 for bank transfer and $10 for Skrill and Paypal. Don’t forget to share this on Facebook, twitter,Tumblr and Google+.